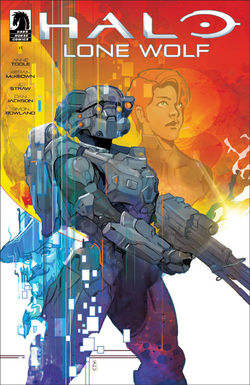 Halo: Lone Wolf Issue 1 was released on January 2, 2019 and is the first of four in the Halo: Lone Wolf series of comics. One year after the Fall of Reach, Spartan Linda-058 is training with her fellow Blue Team squadmates, its War Games environment currently displaying the Ivory Tower map. Through her marksmanship, patience, and agility, she is able to best both Fred-104 and Kelly-087. When the match concludes, Linda is called to a briefing for a mission. An ONI officer, along with the AI Athos inform her of an AWOL scientist Doctor Chen Bax, who was scheduled to be penalized for stealing ONI tech until he was assumed dead at the Fall of Reach. One year later, a distress signal from him and from the missing frigate Promise of Dawn reached the UNSC from the Covenant-occupied planet Sephune III. The distress signal used Covenant tech to broadcast itself, and all UNSC signals towards the planet are blocked. Linda is ordered to head to the planet, assassinate Chen, and extract the Promise's surviving crew. She is not informed why the rest of Blue Team will not accompany her, but will be traveling with Athos. Linda and Athos head to Sephune III in an ONI Prowler. Landing on its surface, Linda finds a man's corpse, recently dead, and takes up a hiding spot overnight to await its recovery. The next morning, human colonists Shen and Hala come to retrieve their fallen comrade, and are attacked by three Covenant Jackals. Linda covertly kills two of them, but refuses to kill the third despite Athos's protests, letting Shen and Hala kill it themselves so as to not give away her position. The two eventually reach the survivors' camp, where Doctor Chen is situated. The rogue doctor maintains a cult of personality over the inhabitants, giving rousing speeches about their need to stay together on this planet and not be tempted to consider leaving towards the dangerous outside. With her target in sight, Athos orders Linda to kill Chen, but the camp is attacked by incoming Drones, Jackals, and Elites. Linda jumps in to kill them and protect the survivors, revealing her presence to them. As the assault is repelled, she turns her sights on Dr. Chen. ↑ Dark Horse: Linda-058's solo mission begins in "Halo: Lone Wolf"